I feel as though I've been eating at the same old places lately and dining on the same old types of cuisine. Well, I decided to break out of this funk and go for something new. I decided to head to Maenam, since I saw Angus An on Global TV this morning talking about Sen Pad Thai. Yes, I am very susceptible to TV advertising. We started off with a Grilled Thai Sausage and Crispy Rice Salad. 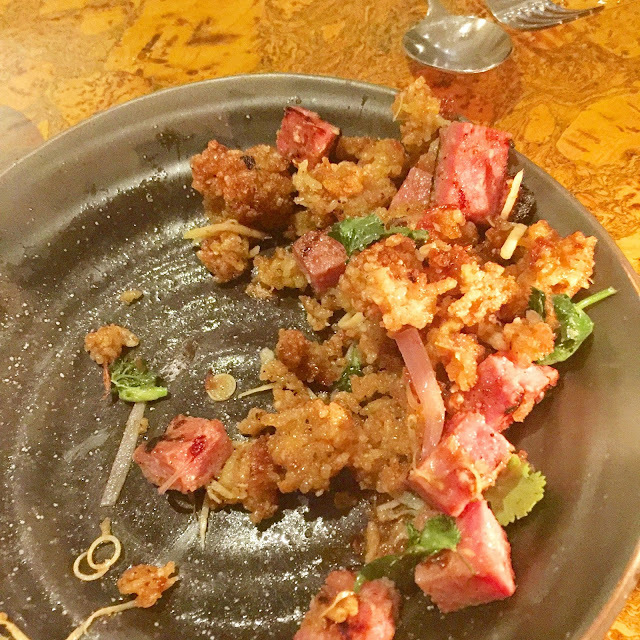 The sausage is house fermented pork, which was reminiscent of Chinese lap cheung (臘腸). There's also some crispy curried rice puffs (think savoury Rice Krispies), all tossed with coriander, lemongrass, ginger, fried shallots, oyster mushrooms, holy basil, and fried garlic. The saltiness of the pork is quite sharp, and the crunch from the rice puffs are perfect for texture. The flavours from the spices are very traditional Thai. This is about half the serving as I was dining with a non-foodie, whose chivalry at serving me beat me to the "phone eats first" mantra that I live by. A whole portion would serve two people nicely as an appetizer. 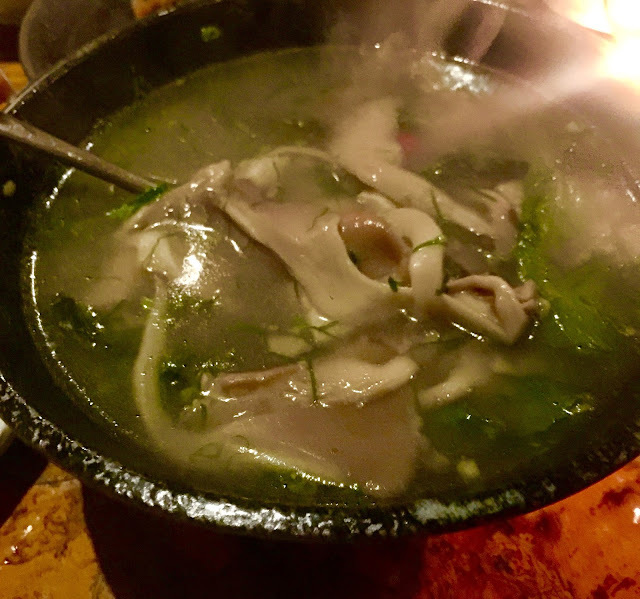 This was another appetizer meant for sharing, it's their Hot and Sour Soup with Halibut Cheek. The heat isn't blow-your-mind hot (but I do have a fairly high tolerance for heat, so beware, my friend thought it was HAWT), rather it's a lingering slow burn. The tartness compliments the spice quite well, and the halibut was cooked perfectly...still tender but not falling apart. And the oyster mushrooms soaked up the soup as well, making every mouthful super tasty. So this was my favourite dish of the night, their 8 Spice Ling Cod. It was truly amazing. The ling cod was super crispy, and topped with a lightly caramelized palm sugar and tamarind sauce. 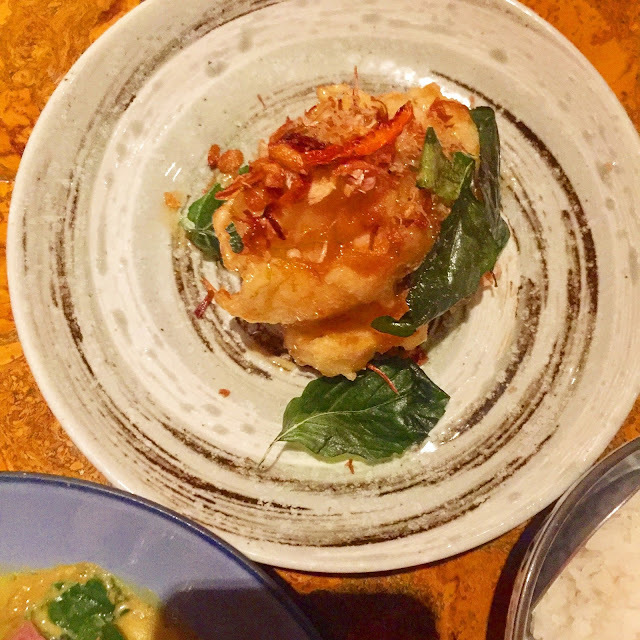 The ling cod stayed crispy under the drizzle of the sauce, and the sprinkling of deep-fried Thai spices and basil was fun. Our final dish was our only curry, the Gang Kau, a Tumeric Curry of Grilled Striploin. 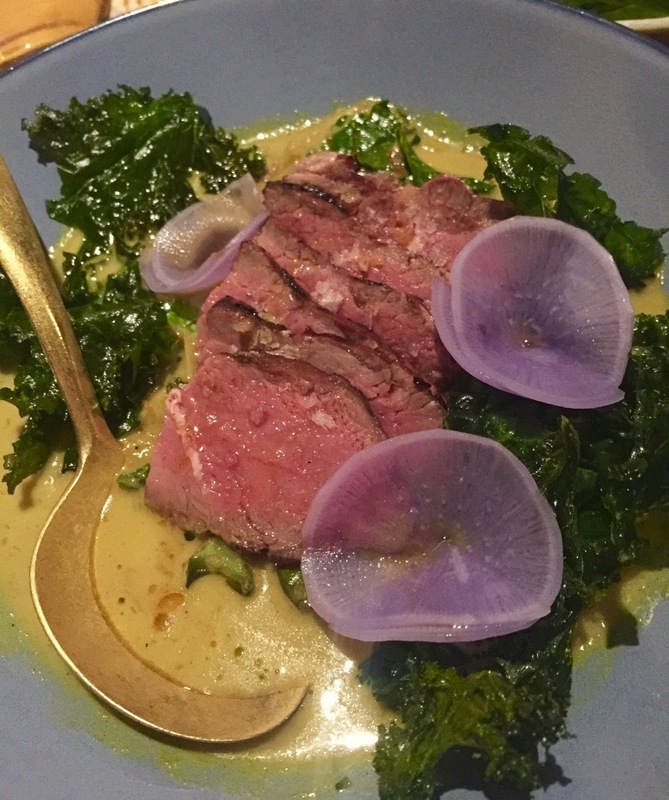 Tender slices of beef cooked to a perfect medium rare, in a vibrantly yellow and fragrant curry, paired with some kale. The shredded ginger and shrimp paste were the top notes in the curry. This was a surprisingly good dinner. I had high expectations since Maenam was named Restaurant of the Year in 2016, Best Thai in 2009-2016 by Vancouver Magazine and ranked 26 in Canada's Top 100 Restaurants in 2015. And all those accolades are well deserved! If you like Thai, do give this place a try.